The Fourth Fleet was established in 24 Sep 1942. In its height, it comprised an array of 36 different types of ships This force gathered nearly 200 ships including those of the Brazilian Navy. This decisive endeavor, made it possible to patrol the vastness of the south Atlantic, securing the sea lanes and hunting the U boats, raiders and blockade runners. Brazilian ships were assigned escorting convoy duties along Pan American zone in conjunction with US Navy ships. Brazilians soon acquired modern ships and updated their men in new ASW tactics. As the war progressed the Fourth Fleet area was extended to the limits of African coast as declared by Vice Admiral Ingram to Brazilian authorities late in 1942. 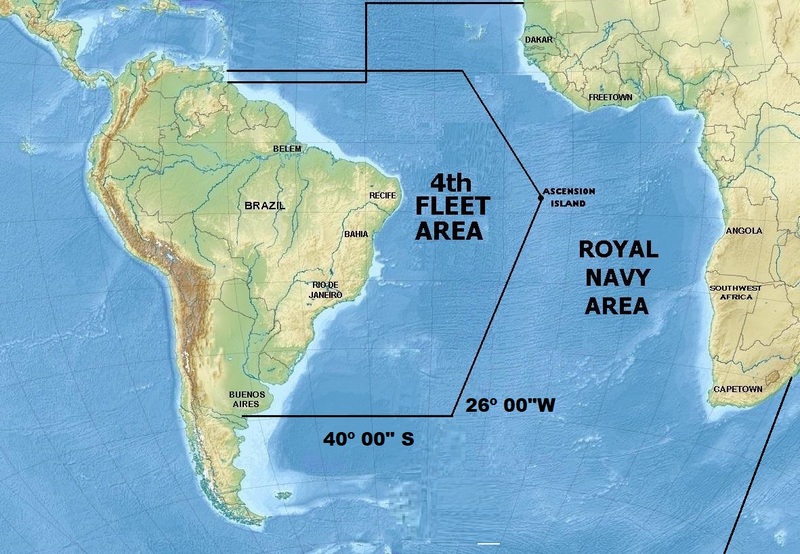 The map shows the vast area assigned to the Fourth Fleet, later extended to the African side interacting with the Royal Navy sector.